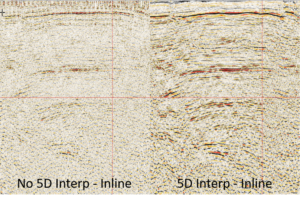 Dayboro’s 5D interpolation program regularizes Pre-stack 3D seismic data in 5-Dimensions; Time, CMPX, CMPY, Azimuth, and Offset. The result of this program is a set of regularized CDP gathers fully populated for each azimuth and all offsets for every CDP. Regularization will help pre-stack migration with cancelation, help remove acquisition imprints and since only the dominant spectral events are being extracted for the output, many forms of noise are left behind. Moreover, the Azimuth Sectors are well populated so that accurate Azimuthal analysis becomes feasible. 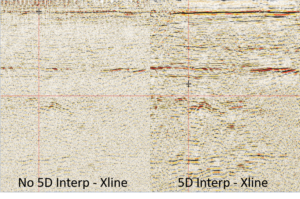 This program regularizes Prestack 3D seismic data in five dimensions. The five dimensions involved are time, CMPX, CMPY, azimuth, and offset. Time refers to trace sample time and is regular to start with. CMPX and CMPY are the common mid points between the shot and the receiver in the X and Y directions respectively. Azimuth is the bearing of the shot to receiver vector. Offset is the absolute distance from shot to receiver. The end product of this program is a set of regularized CDP gathers. Each output gather has the same number of traces. Each trace in each output gather has a CMPX and CMPY equal to that of the output CDP bin centre coordinate that it belongs to. Within each azimuth bin, in each output gather, there are traces with offsets incrementing in an orderly fashion. For each block each trace is converted into the Fourier domain. All the regularized blocks of data are combined to create the output regularized CDP gathers. Fessler, J. A.,Bradley P. Sutton, 2003, Nonuniform Fast Fourier Transforms Using Min-Max Interpolation:IEEE T-SP,51(2):560-74, Feb. 2003. Press W. P., Saul A. Teukolsky, William T. Vetterling, Brian P. Flannery, 1994, NUMERICAL RECIPIES in C, The Art of Scientific Computing, Second Edition: Chapters 12 and 13. On the all 3D datasets we have processed the 5D Interpolation provided a significant uplift to the data.